If you ever get a chance to get aboard the Chris Craft Corsair 34, do not miss the opportunity. We took some time to explore this work of art, and realized that every moment spent on this Chris Craft boat was well worth the time. The Chris Craft Corsair 34 made its debut in 2012, and continues its winning streak even with the recent model launched in 2017. 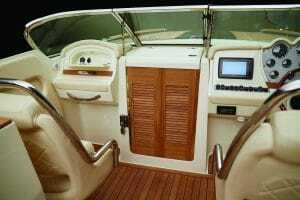 Most 34-foot cruising boats are designed for overnight boaters. But the truth is, not everyone wants to go on an overnight cruise or spend the entire weekend on a boat. There are many boat lovers out there, who would prefer ample space for entertaining and relaxing, instead of spacious berths. The Corsair 34 is a welcome change, as it is perfect for a day-cruise as well as an overnight excursion. The Chris Craft Corsair 34 has the primary mission of being a day boat that can comfortably seat at least 8 people. The tumble home aft, and V-shaped hull are Chris Craft trademarks that make the Corsair 34, the cynosure of all eyes at any yacht club. When required, the Chris Craft Corsair 34 can switch to the role of an overnighter, with basic amenities. To make your stay comfortable is a forward cabin with double sleeping area, a functional kitchen and a bathroom with an enclosed head and sink. When you are looking for some quiet time, retire to the cabin on the Chris Craft Corsair 34. The overhead skylight that runs along the entire length of the forward deck makes the cabin bright, and gives it an expansive feel. The handcrafted wood cabinetry, and custom upholstery contribute to turning the Corsair 32 into the comfort zone that you desire. The Chris Craft Corsair 34 packs quite a punch with the amenities that it offers. A refrigerator, flat-screen TV, stereo/DVD combo, and a Bimini top with stainless steel bows are all part of the standard equipment. The aft cockpit offers U-shaped seating with forward backrests. Seating is lavish and generously proportioned on this Chris Craft boat, and offers guests seating space on the port and starboard areas as well. There are sun loungers facing the rear while the large sun pad in the aft offers a transom walk-over. 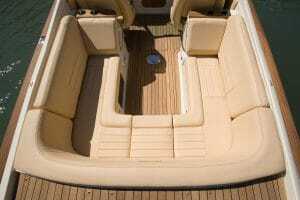 There is enough storage space on the aft deck and under the seats in the port and starboard. Dedicated stowage bins for cushions and sun pads are thoughtful touches that Chris Craft fans are familiar with. The windscreen on the Chris Craft Corsair 32 is made of tempered glass, and offers a center walk-thru. 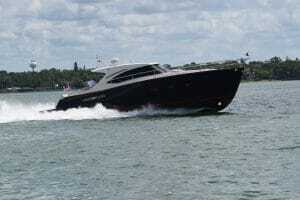 The exterior sports a sleek look and has a foredeck with a flaring bow. The foredeck is covered in your choice of black or blonde teak caulking. The spacious cockpit on the Chris Craft Corsair 34 has a captain’s chair with a double seat, with bolsters that can be tucked up to provide clear visibility. There is a single companion chair on the port side, and stainless steel grab rails and grab handles that ensure the passengers’ safety. The cockpit also has a teak table that is conveniently stored under the teak step-thru beneath the ‘U’ shaped cockpit seating. The mahogany steering wheel has a weighted center cap that spins to display the upright Chris Craft logo. 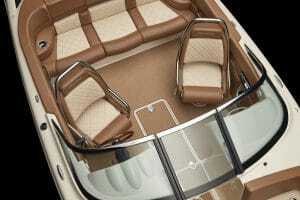 The back of the chaise lounges reveal a hidden space to store fenders that are useful to dock the boat. The summer is already here, and it’s the best time to go boating. For more details on Chris Craft boats, contact the #1 Chris Craft dealer, Dave Bofill Marine Inc. Invest in the Chris Craft Corsair 34 and enjoy the best summer ever! Boats from Chris Craft have long been known for their superior quality, elegant styling and exhilarating performance, and the Chris Craft Carina 21 is no exception. The classic lines and timeless shape of the iconic 1930’s vertical bow models from Chris Craft is captured in the Carina 21. This boat model might be a blast from the past as it is modeled after Chris Crafts of the wooden boat era, yet it’s a thoroughly modern runabout. The Chris Craft Carina 21 might be the second smallest boat in the Christ Craft range, but it packs a mighty punch. The Chris Craft trademark tumblehome design of the hull and the vertical bow also known as plumb bow only add to the Carina 21’s good looks. There is plenty of space in the bow than what you might expect on a 21-foot boat. The generous storage space under the bow seats is enough to accommodate water toys and water sports equipment. The Chris Craft Carina 21 has sleek, graceful lines, beautiful stainless steel grab rails embracing the curves and an intricate teak inlay with your choice of blonde or black caulk. If you are looking for an amazing family runabout it would be hard to beat the Chris Craft Carina 21. Apart from being a classy, elegant, retro the Carina 21 would make an awesome superyacht tender. For owners of summer lake houses with moorings for a primary yacht, the Carina 21 would be perfect to navigate from the dock to the mooring. Also use the boat to cruise to the waterfront restaurants and local bistros, and find yourself turning into the center of attraction. You can also use the Carina 21 for watersports like towing a skier or wakeboarder. 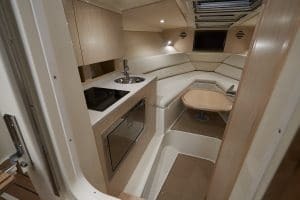 The cockpit floor on the Chris Craft Carina 21 conceals ski lockers that are divided into sections that are adjustable depending on what you want to store. You can also use this space to stow away a cooler that can serve chilled beverages to the guests on board. Standard features on the Chris Craft Carina 21 include in-floor storage lockers, a ski tow pylon and a 3-step retractable swim ladder. On the swim platform is a convenient pullout transom shower and a stainless steel flag pole. The comfortable sun pad is formed by three soft cushions on the aft end surrounded by stainless steel grab rails for additional security. These filler cushions provide a nice walkway from the cockpit to the swim platform. 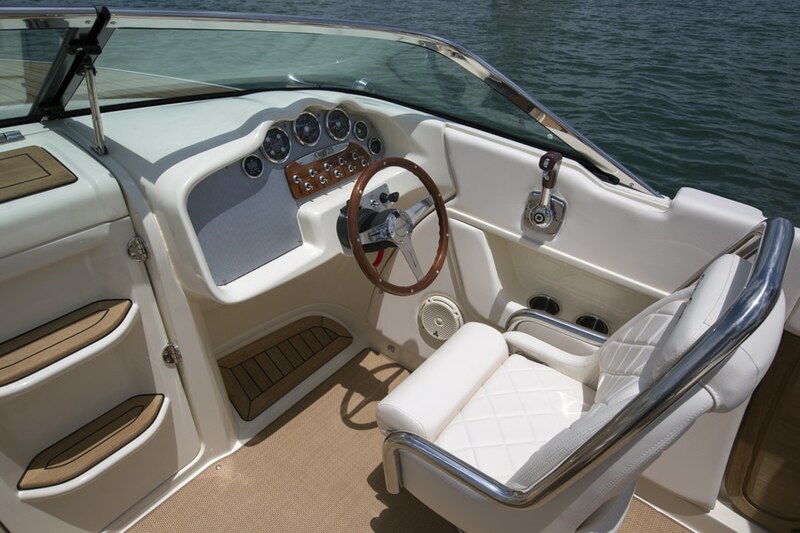 The Heritage Trim edition features teak accents on the swim platform, walkway, bow, cockpit steps and footrests. The Chris Craft Carina 21 can comfortably seat 7 people. Two bucket seats at the helm with flip up bolsters and lined by 316L stainless steel frames add a dignified touch. The beautiful interior with diamond patterned upholstery and polished stainless steel provides pure eye candy. The Chris Craft Carina 21 is not all about good looks. When it comes to comfort and a smooth ride, the boat provides top notch quality. Keep a cold drink within easy reach in the four beverage holders in the cockpit. 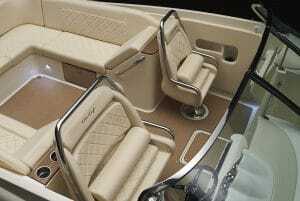 The aft seat conceals a Bimini top. 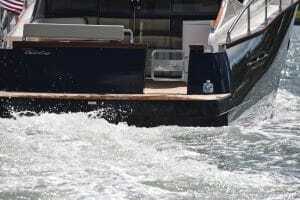 This boat can cruise at a top speed in the mid-50 mph range. All good things come in small packages and that is especially true of the Carina 21. This stunning beauty is truly an American classic. The Carina 21 looks as striking in the water as it is in pictures. To take a closer look at the Carina 21, get in touch with your premium Chris Craft dealer, Dave Bofill Marine. The Chris Craft Launch 30 is a strikingly beautiful boat that combines the best features of a classic runabout and a bow rider. Just like the other boats in the Launch family, the Launch 30 exudes style and elegance. 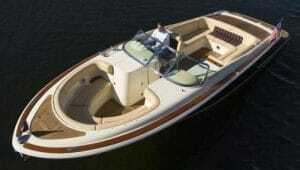 When the Launch 30 was first introduced, it resembled the lovely wooden runabouts from the 1950’s. This boat model was a big hit at the boat shows held in New York and Florida. 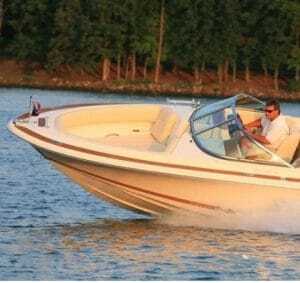 Years later when the Launch 30 was reintroduced to represent the Chris Craft of today, it continued its winning streak in terms of popularity in the boating circuit. Reminiscent of its proud heritage, the new Launch 30 is presented in a new design and technology. The sleek tumble home design, the sturdiness of a fishing boat and the fittings of a luxury car were all combined to design the new Chris Craft Launch 30. 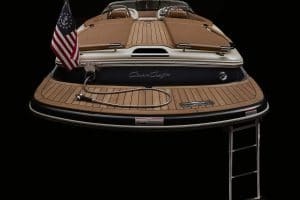 The trademarks of the Chris Craft brand is evident in the Launch 28’s deep-V hull bottom, flared bow, teak trim and the iconic Chris Craft flag. Reverse down angle chimes run the length of the boat and contribute to a smooth and stable ride. The teak swim platform on the heritage edition of the Chris Craft Launch 30 with a retractable stainless steel swim ladder provides quick entry into the boat after a relaxing swim. You can also have an optional walkthrough with a removable seat cushion. Perfect for day boating the Launch 30 can easily accommodate 10 people aboard. The large seating area provides ample space for your family and guests to enjoy the cruise. The circular bow area is wide and has insert cushions that can convert this space to a huge sun lounge. There is plenty of storage space to get these filler cushions and boating gear out of the way when not in use. The fit, finish and layout of the Chris Craft Launch 30 is top-notch. The helm seat is double the normal width and can accommodate 2 people. The flip-up bolster on the helm seat adds ergonomic flexibility and allows the captain to stand with support while navigating the boat. Ideal for water sports and for entertaining friends and family, the boat is full of practical features. A Bimini top is standard on the Launch 30 and can be stowed away under the engine hatch when not in use. The refrigerator in the galley can stock your choice of food and the optional freezer plate can be used to keep your drinks cold while you indulge in your favorite water sport. Listening to music just adds to a great boating experience and this is made possible with the stereo system and speakers on the Launch 30. The head compartment is neatly tucked under the forward console of the helm. At the helm of the Chris Craft Launch 30 is a tilt steering wheel in mahogany with solid aluminum spokes. The perforated metal dashboard is a traditional Chris Craft feature. You can also opt for a Garmin multifunction display and Sirius satellite radio that streams music, entertainment, news and sports channels. A full set of backlit dimmable gauges monitor the engine. There is also a depth finder with an alarm and an illuminated compass. Twin Mercury V8 6.2L engines with increased fuel capacity provide a truly impressive performance. With lots of add-on options like a windlass, teak cockpit table, woven seagrass carpet and underwater lights, you can own the Chris Craft of your dreams. Drop in and you’ll see why Dave Bofill Marine is the #1 Chris Craft dealer in the network! The Launch series of boats from Chris Craft was originally designed to compete against sports boats from other quality boat builders. 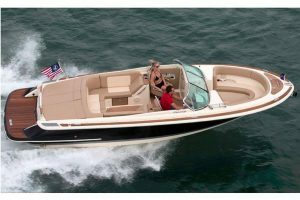 But unlike its rivals, Chris Craft introduced some great features in this line up which made it a perfect boat for the entire family. The Chris Craft Launch 27 has a timeless appeal, which is probably why it’s a favorite of Chris Craft fans. So much so that Chris Craft introduced a redesigned model of the Launch 27 in 2016. So what’s different in the latest model of Launch 27? The newly redesigned Chris Craft Launch 27 has a more generous seating area which makes it ideal for a long cruise over the weekend. The Launch 27 can comfortably accommodate 8 to 10 people. The longer hull and wider beam contribute to making the boat spacious. Not just that, the latest edition promises increased power and agility. The style quotient on this mid-sized boat has only increased over the years. Ideal for trailering, the Chris Craft Launch 27 promises fun for the entire family. Enjoy your favorite water sport of skiing or swimming and haul yourself on to the Launch 27 using the three step swim ladder. The swim platform has a concealed pressurized fresh water system with a hand shower to rinse off after a refreshing swim. The swim platform and sun pad are beautifully integrated into the boat’s design. The deep-V hull on the Chris Craft Launch 27 has reverse chines that run down along the length of the hull. This design of the hull guarantees stability and deflects spray for a drier ride. All hull fittings are made of chrome plated stainless steel. The tempered glass windshield rimmed with stainless steel is stylish. At the helm is a solid mahogany tilt steering wheel with stainless steel spokes that can be adjusted for greater comfort. The double helm seat has flip up bolsters and cushioned armrests that add to the comfort. The perforated metal dashboard is a standard feature on Chris Craft boats. Full of practical design features the deep cockpit on the Chris Craft Launch 27 has a comfortable seating area. The U-shaped seating area on the bow is extremely comfortable allowing the driver to talk to passengers while remaining in full control of the boat. The cushion foam is covered with a bio treated bag to make it resistant to mold and mildew. There is plenty of storage space under the rear seating area. The cushions can be removed and stowed away when not in use. This is a nice feature to have when you are looking for additional storage space. The center of the floor conceals a cooler storage bin. There is a ski storage area too. The stern has a hidden pop up ski pole. 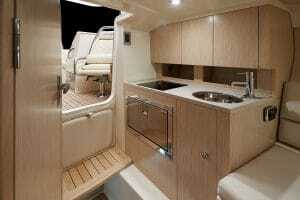 A Bimini top that stows away neatly is standard on the Chris Craft Launch 27. An interesting feature is the head that mounts inside the passenger side console and the inclusion of a pressurized fresh water sink. You would not expect that on a boat this size. On the bow is a dedicated storage locker. The automatic engine hatch is insulated and stays nice and quiet when you need to have conversations. The stainless steel trumpet horn and the extra flare in the bow enhance the retro classic look of the boat. The Launch 27 is an eye-catcher that’s bound to be treasured as a collector’s item. Pay a visit to Dave Bofill Marine; the premium Chris Craft dealer showroom and go on a quick spin on the Launch 27. 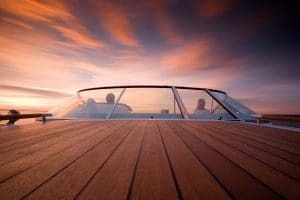 In 1964, Chris Craft set a new precedent in the boating industry as it unveiled its first all- fiberglass cruiser at the New York City National Boat Show. Rightly named the Commander, this boat commanded the attention of the marine industry as well as boating enthusiasts alike. But the Commander’s dream run came to a halt in 1989 when Chris Craft stopped production. Fast forward to 2016, and the latest buzz on the boating circuit is that Chris Craft has reclaimed one of its most famous names by introducing the Chris Craft Commander 44 at its dealer meeting. Following this, the Commander 44 will be showcased at all major boat shows and events across the world. The Chris Craft Commander 44 marks a big step for the brand as it enters the cabin cruiser market. Add Chris Craft’s timeless heritage and signature design to a historical lobster boat, give it a modern twist and you have the Commander 44, a perfect addition to the brand’s impressive lineup of boats. With a distinctive hull design, the Commander 44 pictured here is powered by twin Volvo engines and displays classic Chris Craft design details throughout. The generous usage of wood, a Chris Craft trademark is evident in the Commander 44 as you can opt for a gunwale and handrails in mahogany or teak. The teak decking features a hue of blonde or black depending on your taste. Life is good on a Chris Craft, and it’s even better on a Chris Craft Commander 44. Designed to impress, be it formal or casual entertaining there is room for 12 people aboard. Guests can enjoy sun bathing on the bow or listen to their choice of music using the stereo system that supports Bluetooth and is compatible with an iPad/iPhone. The Commander 44 features two cockpit areas. The aft cockpit with comfortable seating provides an open area for entertainment. In case of unfavorable weather the cockpit area under the hardtop can be converted into a cozy entertainment space enclosed by sliding doors. When you get friends and family aboard the Chris Craft Commander 44, you would love to have access to a functional galley to cook delicious fare. The electric hob, sink with hot and cold water, drawers with holders for cutlery, microwave and refrigerator is all that one could wish for in a compact kitchen. Fancy dining al fresco under a canopy of stars? The cockpit area can be converted into a dinette that features lacquered tables with a stainless steel hi/lo system. The large sofa in the cockpit has enough storage space for a life raft. The pressurized fresh water pump in the engine compartment ensures a constant supply of water to the fixtures in the galley, head and shower. The helm station on the Chris Craft Commander 44 has a double helm seat that is comfortable. The windscreen features wipers with washers to ensure clear visibility. A sliding access door to the lower deck reveals two cabins that can provide overnight accommodation for 5 people. The main cabin with its queen bed, safety locker, wardrobes and panoramic hull windows makes your stay comfortable. 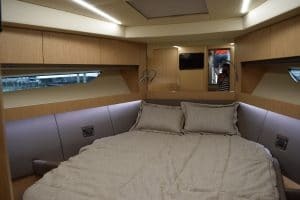 The second cabin is equipped with a queen bed and a single bed. The bathroom is replete with a complete set of bathroom fittings. There is a separate shower cabin too. With a luxurious setting such as this one, an overnight stay is difficult to resist. 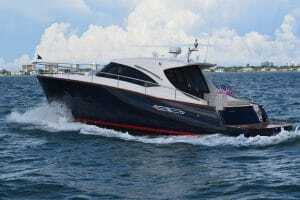 Chris Craft is all set to storm the cabin cruiser market with the Commander 44. Get in touch with your Chris Craft premium dealer, Dave Bofill Marine for more information on a boat that was definitely worth the wait. 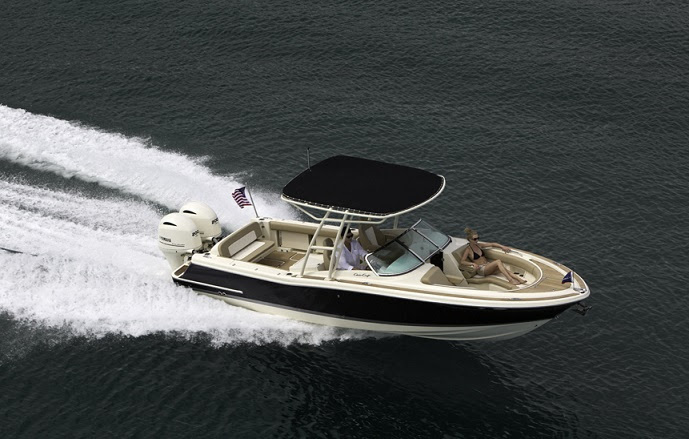 The Chris Craft Corsair 27 is a perfect example of a boat that’s sleek and powerful. 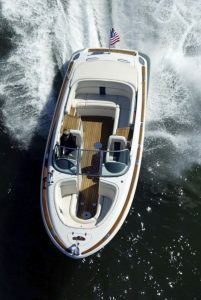 It carries on Chris Craft’s runabout heritage with practical design features, stunning craftsmanship and graceful lines. Island hoppers will love the idea of owning a Chris Craft Corsair 27, as it offers transportation in great style and comfort. The Corsair 27 has a covered foredeck that conceals a cuddy cabin underneath. Perfect for water sports, it has a swim platform that is beautifully integrated into the overall design. The three-step stainless steel swim ladder makes it easy to step aboard after swimming or water skiing. The Chris Craft Corsair 27 offers ample space in the main deck area and can accommodate up to 6 people comfortably. There is plenty of storage under the seating area to ensure that you have access to water sports equipment whenever you need it. 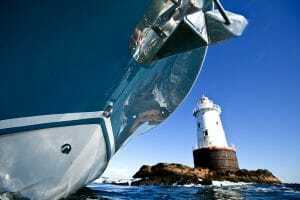 An optional stern navigation light is an additional safety feature in case you decide to go on a cruise after sunset. Nonskid flooring in a diamond pattern is standard on the Corsair 27. In the center of the floor is a cooler storage area with an insulated removable cooler that is easy to clean and load. If that’s not enough add a refrigerator as an optional accessory and you have the perfect summer boat. Classic teak decking is standard on the Heritage edition of the Corsair 27. The boat comes with a choice of convertible top or Bimini top which can be stowed under the engine hatch when not in use. An optional cockpit cover can protect the boat when you are not using it. The deep-V hull bottom, a flared bow and aft hull tumblehome design are striking features on the Chris Craft Corsair 27 differentiating it from other boat brands. The centered walkway on the foredeck provides access to an anchor locker. An optional sundeck ensconced on the foredeck fits in between the stainless steel handrails, giving the assurance that your safety is of prime concern. 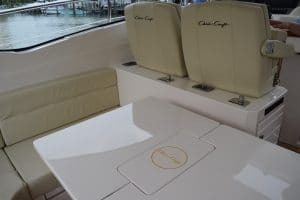 The bolster cushions, luxurious upholstery, stainless steel beverage holders and grab rails only reiterate the feeling that the Chris Craft brand stands for comfort and luxury. The curved tempered glass windshield with stainless steel frames provides a walkthrough to the foredeck. The tilt steering wheel in the helm is made of mahogany and has polished aluminum spokes. The perforated metal plate dashboard is another standard Chris Craft feature. If you have decided to spend an idyllic day on water, the cabin in the Corsair 27 is perfect for an afternoon snooze. The concealed porta potti comes in handy when you have kids on board or when you go on a longer cruise. The Corsair 27 is small enough to be towed and if required can tout its own towing power. In Chris Craft’s words “Nothing compares to the first time you drive a Corsair, except for the next time and the time after that….” Pay a visit to Dave Bofill Marine; your Chris Craft full stocking, premium dealer to take a test ride of the Corsair 27 and we bet you can’t agree more. If there is one name that continues to dominate the recreational boating market in America even after more than a century, it is Chris Craft. Since 1874 Chris Craft boats have been setting a standard for other boats to measure up to and even today, nothing seems to have changed. Chris Craft’s vision is to build boats that stand out in a sea of sameness. This is probably the reason why a Chris Craft, new or old, stands out even if it is surrounded by many other boats. Here are some observations on what makes Chris Craft different from other boat manufacturers. When compared to any other boat manufacturer Chris Craft devotes more time and effort in boat building. This is because each Chris Craft boat is made to order and the manufacturer continues to use hands-on techniques along with modern technology. You can spot a Chris Craft from a mile away due to its distinctive V-shaped hull and tumblehome design. This is a shape that is engineered for stability and optimal performance even in unfavorable weather conditions. The flared bow provides extra deck space and knocks down the spray ensuring a dry ride. The reverse transom not only contributes to an enhanced visual appearance but also makes rear entry and exit via the swim platform easier. Chris Craft boats follow a 6-step lamination process that ensures the highest standards and is responsible for the boat’s stunning exterior. The gel coating on the exterior is sealed with UV-resistant polyurethane. Paint applied over the gel coat for a glossy finish is long lasting and resists oxidation that troubles most fiberglass boats. The expensive but less permeable vinylester resin used in the gel coat resists cracks and blisters. A Chris Craft never shudders or rattles in rough weather because the stringer grid is bound to the hull with weld-on adhesive making the two parts behave like a single part. When you buy a Chris Craft, you buy a boat that lasts a lifetime. 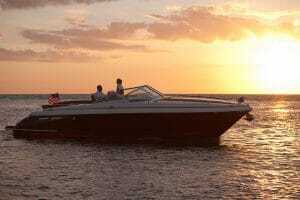 There are very few boat manufacturers that can boast of a rich American heritage as Chris Craft. It was one of the first American vessels to storm the beaches of Normandy. The engineering department of Chris Craft uses the latest computer aided manufacturing techniques. 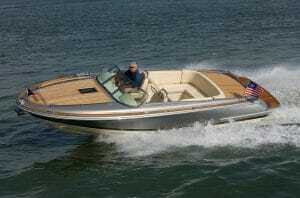 But even todayChris Craft boats are made of signature molds some of which are based on designs that are decades old. This is a brand that continues to uphold its tradition as a true American legend. Chris Craft’s designs are simple, yet have an understated elegance. Hands-on boat making techniques are combined with modern technology to create boats that are a pleasure to own. 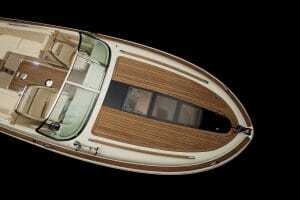 If there is one material that has defined a Chris Craft boat, it is wood. 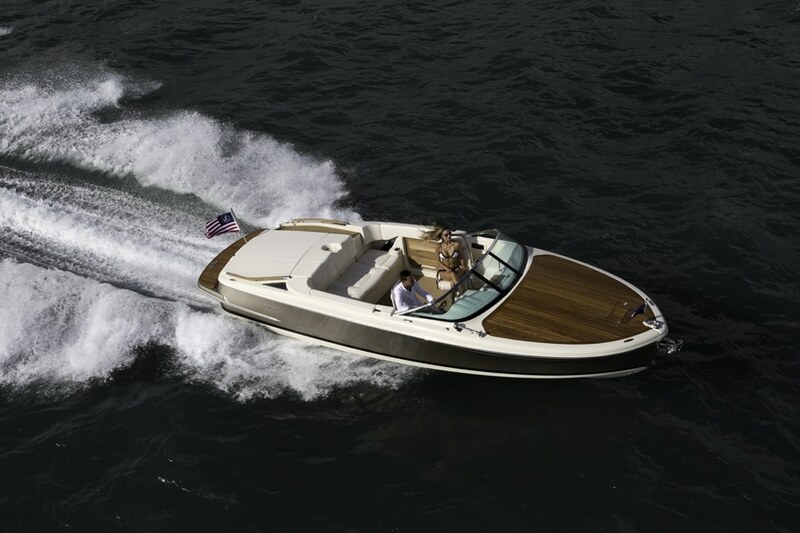 Each model of Chris Craft features retro styling with teak accents. Teak decks add a traditional feel and a timeless quality indicating that today’s Chris Crafts continue to be built exactly as Chris Smith envisioned them. The passion for wood is not limited to teak but extends to a generous use of mahogany, oak, maple and cherry wood in the boat’s exterior as well as interior. One look at the modern day Chris Craft and you realize that the attention to detail is amazing. 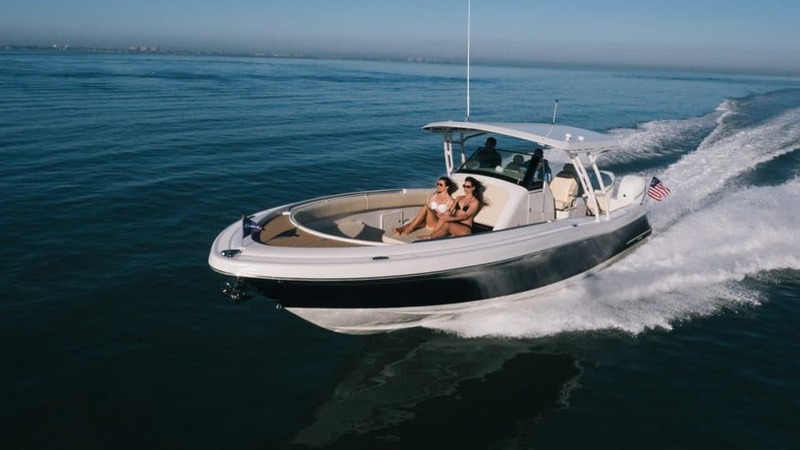 Examine the double stitched upholstery, and the bow lights and windshield frames that have been custom designed to match the Chris Craft styling. Chris Craft is a brand that always strives to exceed customer expectations. And any time you wish to experience the Chris Craft difference, visit Dave Bofill Marine; your Chris Craft full stocking, premium dealer. The Catalina 34 is the largest in Chris Craft’s Catalina series and features a classic design combined with the latest technology. It’s interesting to note that this Chris Craft was designed after taking into consideration feedback from our customers and dealers. The Catalina series was initially designed for the fishing boat market, but with the Catalina 34, Chris Craft turned it up a notch. The Catalina 34 is instead designed as a luxury center console that oozes glamour and sophistication. With a fuel capacity of over 300 gallons, speeds in the lower 60 mph range, available as twin or triple engine combination, the Chris Craft Catalina 34 makes long-range excursions a breeze. The fiberglass transom door and the straight walk through from the swim platform, lends access to the cockpit, without moving seats and cushions. Dive access is provided through a door on the side of the hull that comes with a drop down boarding ladder. Ample seating is provided in the bow area and if family or friends are aboard, the sun pad can be converted into a lounge space replete, with arm rests and drink holders. Full of practical design features, the Catalina 34 has a self-draining cockpit. The classic deep-V hull and distinctive bow flair is synonymous with the Chris Craft brand. The Catalina 34 is sure to make waves with a family that’s looking forward to having a fun day on the water. The open cockpit features seating on both sides with extra foldout seating. The helm area on the Chris Craft Catalina 34, with its triple helm seats, is ergonomically designed to give you a heightened sense of control. The sport top, with a molded roof and pullout sunshade, ensures that you stay out of the sun. The live bait well, fish boxes and rod holders are only going to add convenience to your fishing trips. For an overnight weekend cruise, make use of the comfortable air-conditioned cabin and head. A hot and cold transom shower is also part of the standard equipment. Apart from luxury features, the Catalina 34 makes use of the best technology. The quality of fit and finish is evident in every detail on the Catalina 34. The Chris Craft Catalina 34 provides a wonderful platform for entertainment and can accommodate up to 14 people. If entertainment for business or pleasure is your priority, then instead of the bait well, opt for a summer kitchen that includes a grill, microwave, 2 burner stove, refrigerator, icemaker and sink (in addition to storage shelves). The plush seating, aft teak table and fiberglass table in the bow, enhance the fine dining experience. Crafted with perfection and designed for boating’s pleasures, the Catalina 34 is a fishing boat, a sports boat and a family boat all rolled into one! Visit the North East’s # 1 Chris Craft Dealer’s facility to take a closer look at the Catalina 34. Chris Craft, America’s boat builder since 1874, has been designing boats that are a pleasure to own and use for more than a century. As always, Chris Craft turned heads at the Fort Lauderdale International Boat Show (FLIBS) held in November 2015 with the debut of the Calypso 26. A great design always appears to be simple and understated and the Chris Craft Calypso 26 is no different. At the same time, the Calypso 26 introduces a design change that has never been seen before on a Chris Craft production. It is the first boat from Chris Craft to feature a dual console. The Chris Craft Calypso 26 is poised to change your experience of a day on water be it cruising, casual fishing, water sports, or entertaining. With a 21 degree deadrise, the deep V hull bottom and flared bow promise stability and dynamic performance. The wood-free hull construction keeps the boat light-weight. The curved glass windshield with a stainless steel lower frame and a custom fitted Bimini top offers ample protection from the sun. Whether your choice of sport is fishing or water skiing you will surely appreciate the in-floor storage for fishing rods, wakeboards, and ski gear. In addition, there is console storage for life jackets and dock lines in the cockpit. A perfect combination of style and utility, the Chris Craft Calypso 26 is the aquatic version of an SUV. The windshield of the Calypso 26 has a center walkthrough that leads to the bow area. Soak up the sun from the sunpad and plush seating in the bow. Stainless steel grab handles are provided for extra security. Generous storage is concealed in the base of the wraparound bow seating. The small retractable table in the bow area lets you enjoy a delicious snack or brunch in style. A drink is always within easy reach as you can place it in the stainless steel beverage holders. 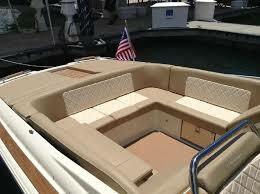 As with any other Chris Craft boat, the upholstery is durable, comfortable, and ergonomically designed. The Calypso 26 has an open aft cockpit, but if you need additional seating space, it is provided by the foldout seats. The boat can comfortably accommodate 8 people aboard. Opt for an additional accessory like the neat rectangular dinette that is concealed in the cockpit and springs up when required. An electric grill and stainless steel refrigerator are additional options to be considered if you plan to use the boat for entertaining. The Chris Craft Calypso 26 features a dual console that makes it a boat with a multiple personality. 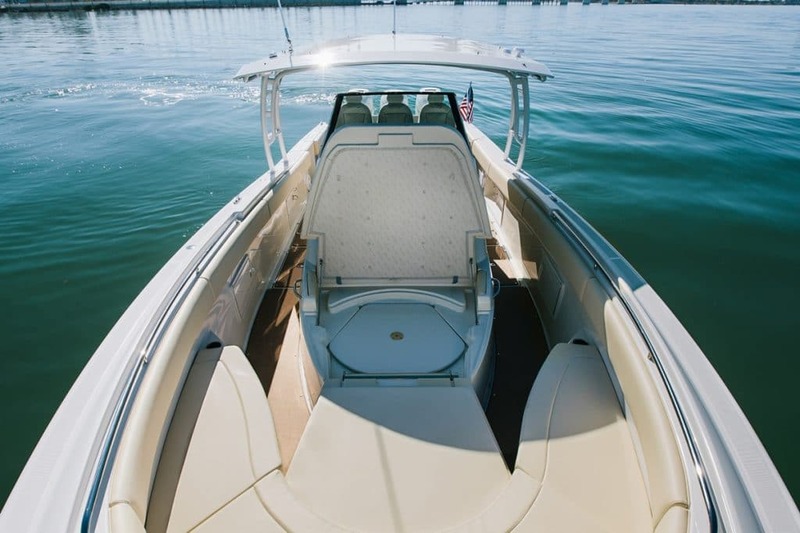 Whether you choose to fish, wake-board, ski, lounge around on the sunpad, or entertain, a dual console is a good choice because of its open design and comfortable seating. The helm and companion seats come with arm rests and a thigh rise leg roll bolster. The head encloses a sink with faucet and porta-potti. The boat is equipped with single or twin Yamaha or Mercury engines. You get a cruising speed that tops 50mph with a single 350hp engine. What if you do not want to splurge on teak? Instead of going for the Heritage Trim Edition opt for the PlasTeak edition where the standard teak parts are replaced with synthetic teak except for the console accents which feature the Chris Craft trademark of genuine teak. Do you want to have a good boating weekend or a great one? If it’s the latter then you can never go wrong with the Chris Craft brand. Check out your options and get more information on the all-new Calypso 26 from Dave Bofill Marine Inc., the #1 Chris Craft dealer. If there is one brand that’s credited with inventing the runabout market in the boating industry, it is Chris Craft. 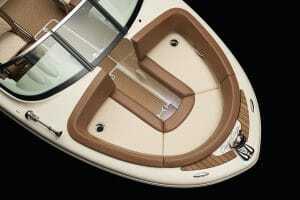 So it’s natural that boating enthusiasts take notice whenever there is a new runabout model introduced by Chris Craft. In an impressive line up to its 2016 models, Chris Craft introduced its latest runabout, the Capri 27 at the September 2015 Cannes Yachting Festival. 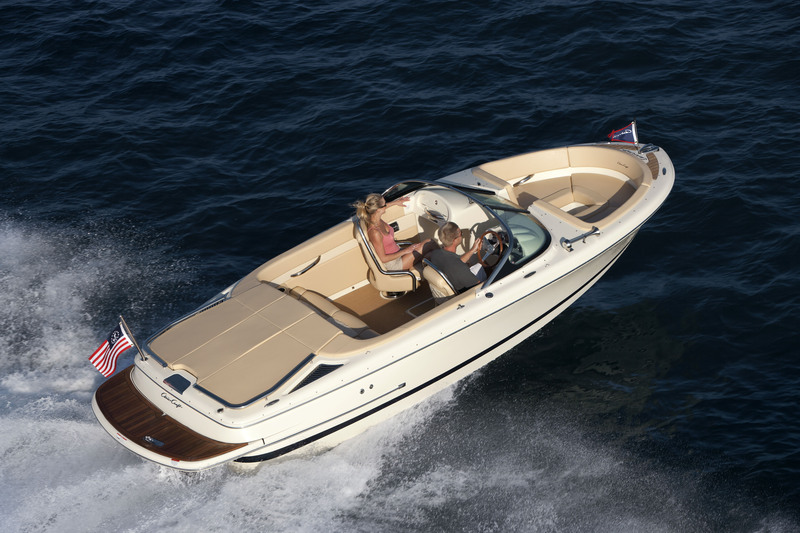 The Chris Craft Capri 27 has a design that is based on its rich legacy of vertical bow riders from the 1930’s. The second model in the Capri range, the Capri 27 is made of fiberglass but its styling reminds one of Chris Craft’s vintage mahogany boats, including the signature sloped tumblehome design. The Capri 27 features a hydraulic walkthrough on the port side for easy boarding, a feature that’s new to the entire range of Chris Craft boats. The walkthrough can be raised or lowered with the press of a button. The deep V-shaped hull bottom with a vertical bow offers the much required stability while cruising at high speeds in rough waters. One glance at the boat’s profile is enough to notice that the finish and attention to detail is amazing. 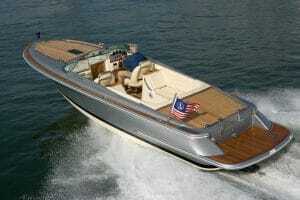 What’s a Chris Craft without its classic lines and teak accents? And the Chris Craft Capri 27 does not disappoint on that front. If you love the teak-finished look, opt for the Heritage edition. There is a generous usage of teak on its closed foredeck, the swim platform, cockpit floor, footrests, engine hatch floor, along with accents on the bow and side. The swim platform with its retractable 3-step ladder not only offers easy access to the water but is also a nice place to hang out. It’s fun to dangle your feet in the water on a warm summer day. The teak decked walkway that runs from the swim platform lets you step into the plush cockpit in style. If you thought entertaining is not an option on this boat, then check out the clever cockpit arrangement with foldout teak tables on either side. Get your picnic hamper aboard, listen to your choice of music on the stereo system with speakers and subwoofer, and you have a stage set for entertaining. The Chris Craft Capri 27 can comfortably seat 6 people. The two bucket seats with flip up bolsters at the helm can swivel 180 degrees and are fitted with stainless steel handrails. There is an additional bench seat at the aft end. The upholstery is a class of its own with the diamond pattern that reminds one of a classic sports car. Add to this a custom fitted mahogany steering wheel, and you have a boat that spells retro chic. Come rain, wind, or sunshine, there is a concealed Bimini top at your disposal tucked away under the aft cockpit seating. The Capri 27 may sport a retro design but it comes with all the modern fixtures and fittings. A hinged door in the cockpit leads to a cuddy cabin under the bow that includes a portable toilet. While it may not offer the luxurious comfort expected for an overnight stay, who says you can’t take a nap? Powered by a standard 300hp Mercury V8 or a Volvo Penta engine, the Capri 27 is capable of providing a pleasant ride even on choppy water. If this is not enough there are other engine choices too. The engine hatch also provides storage space. To take a closer look at this piece of art, get in touch with New York’s #1 Chris Craft dealer and gear up to make a statement on water.